While cabbage rolls are not uniquely considered Japanese cuisine, it is a very popular "yoshoku"-style (Western food with Japanese influence) family dish that is often made and served at home. Large cabbage leaves are filled with a meat mixture and served in a bit of broth. In this cabbage roll recipe, a mixture of ground pork, and diced carrots, onions, and shiitake mushrooms are incorporated into the filling. 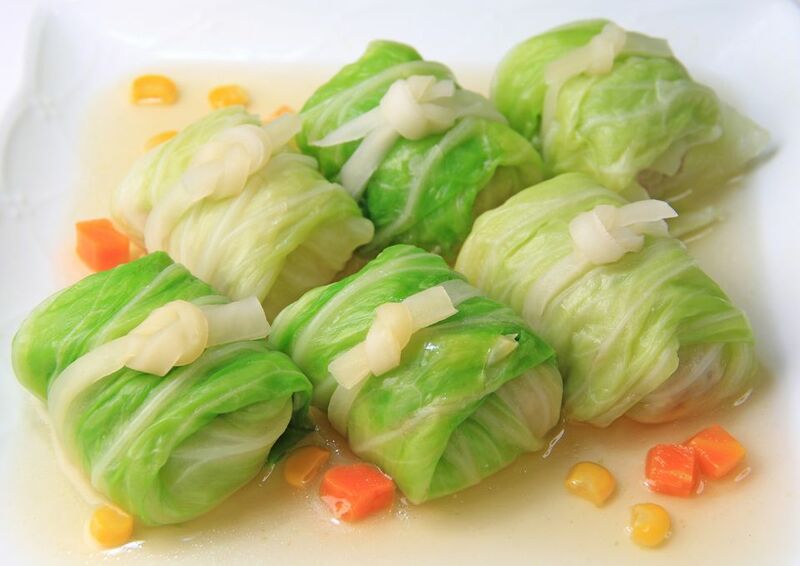 After wrapping in cabbage leaves, the bundles are simmered in a light chicken stock seasoned with soy sauce. To close the cabbage rolls, you can either use toothpicks or reconstituted dried daikon strips (hoshidaikon) to tie the cabbage bundles closed. Wash cabbage leaves and remove tough stems from the bottom. Bring water to a boil and cook cabbage leaves for 3 to 4 minutes until softened. (Alternatively, the cabbage leaves may be steamed.) Drain well and set aside. If you are using dried shiitake mushrooms, quickly reconstitute them in warm water, squeeze out excess water, and then slice. Finely mince shiitake, carrot, and onion. In a medium bowl, mix ground pork with the vegetables. Season with black pepper and salt and mix further. Use your hands to quickly incorporate ingredients and knead the pork and vegetable mixture. Divide the pork mixture into 8 portions. Put one portion of the pork mixture on each cabbage leaf. Roll it up, folding in the sides and rolling from the bottom up. Close each roll with a toothpick or daikon strip. Place cabbage rolls in a large pan. Pour over chicken soup stock and soy sauce. Add frozen vegetables, if using. Simmer the cabbage rolls on low heat until meat is cooked, about 30 minutes. To serve, place 2 cabbage rolls in 4 shallow bowls and spoon over some broth. This is a great dish to make ahead of time, and refrigerating the stuffed cabbage rolls allows the filling to solidify, preventing the filling from drying out and making the pork juicier. Follow the recipe up to closing the cabbage bundles and place in the fridge. Before serving, let rolls simmer in broth. If you would like to tie the cabbage rolls with hoshidaikon, you can purchase dried daikon radish, which is called kiriboshi daikon. The thinly sliced radish is dried in the sun, creating more of an umami flavor. To reconstitute, rinse however many strips you need, soak in water for about 20 minutes, and then squeeze dry. A lighter variation of this dish worth considering includes Japanese cabbage rolls filled with ground chicken and served in a tomato soup.